This last chapter is intended to clarify some central methodological aspects of morphodynamical abduction as regards dynamical systems and the catastrophe theory. Some problems arise in the classical computational approach to cognition in describing the most interesting abductive issues. A cognitive process (and thus abduction) is described by the manipulation of internal semiotic representations of external world. This view assumes a discrete set of representations fixed in discrete time jumps and, because of its functionalist character, cannot render the embodied dimension of cognition and the issue of anticipation and causation of a new hypothesis adequately. An integration of the traditional computational view with some ideas developed within the so-called dynamical approach and catastrophe theory can lead to important insights. 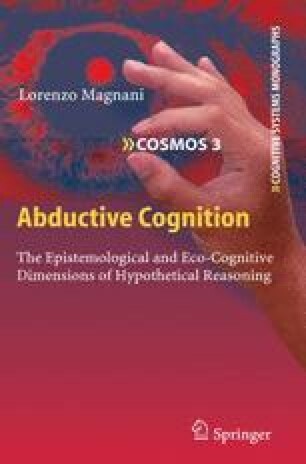 What is the role of abduction in the dynamical system approach?What is the role of the “salient/pregnant” dichotomy with respect to abduction?What is embodied cognition from the point of view of its “physics”?